When You wacth television, when you go to plaza or mall, When you go to China Home Town, you will see the building is domianted with red color, red lantern, cat statue waves hand, moon cake, angpao hang on a tree as a voucher, and the red colored ornaments. And for you who love shopping you will read on banner written “Special Price, 70% pluss 30% off, it means free”. What happen with them. We have known that on January 26 2009 Chinese in the world and also in Indonesia will celebrate Chinese New Year!! Red Color symbolizes goodness, ultimate joy and prosperity in Chinese culture. Red shows happiness and spirit which will bring them to fortune and good luck. Based on Kompas, Chinese Cultural Observer, David Kwa explained in www.kompas.com that “Red color means happiness, Chinese wish that they will create positive atmhosphere and dispell the negative one. The special meaning of Angpao and its history? 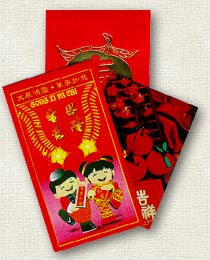 Based on Wikipedia.com Angpao is a red envelope which contains money as a present to welcome Lunar New Year “Imlek”. On The Chinese New Year angpao has special meaning “Ya Sui”, a present which is given to children to memorialize the increase of age and year commutation. In the last times Parents always gave their children a candy, bonbon, and small orange as Ya Sui. Then in the present period Parents feel easier to give money and let the children decide to buy what they want. This new tradition occurred during Ming and Qing Dynasty. In one of literature about Ya Sui Qian, It’s written that children used their money to buy firecracker, fireworks, and candy. It means that Ya Sui tradition participated in increasing money circulation and supporting the economy in Tiongkok. Angpao, Hongbao, or Ya Sui. Sui means age, calamity, and disaster. So Ya Sui is symbolized as “chase away or minimalize the calamity”. Parents wish that their children will be able to pass next year safely and peacefully without any hard obstcle. In Chinese tradition, the person who gives angpao is he or she who has got married. Marriage is believed as the constraint between children and adult period. Beside that, there is a belief that Someone who has got married is already in a proper life. Giving Angpao to the youth and elder. For the persons who haven’t got married, they stiil have a right to get angpao even they have become an adult. And the persons who give, wish that he or she will get married soon. Gong Xi Gong Xi. Gong Xi Fa Chai, Happy Chinese New Year.